Line one large cookie sheet (or two small ones) completely with foil. Cover the bottom of the pan with baking parchment or a silcone baking mat–on top of the foil. Line the cookie sheet evenly with the matzohs, filling in any spaces with extra pieces. In a medium heavy-duty saucepan fitted with a candy thermometer, heat the water, butter, salt, and both sugars. Cook, stirring as little as possible, until the thermometer reads 290 F degrees. Pour caramel over the matzoh, covering completely. Let stand about 2 minutes and then sprinkle with the chopped chocolate or chocolate chips. 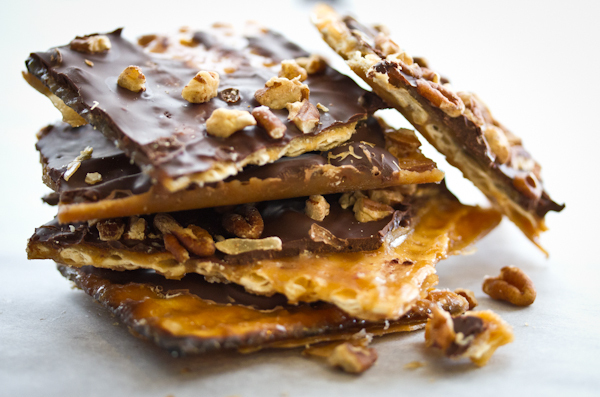 Allow chocolate to melt for a minute or so and then spread it entirely over the matzoh. Sprinkle chopped nuts (if using) over the chocolate covered surface. Allow to cool completely (in the fridge is fine) and then break into squares or shards. This sounds like a truly tasty Passover dessert, in the world of Passover desserts! It will astound you, Haralee! how long should you cook the matzoh bark at 375 degrees?